The new Apple Pencil delivers pixel-perfect precision and industry-leading low latency, making it great for drawing, sketching, colouring, taking notes, marking up emails and more. The new Apple Pencil is as easy and natural to use as a pencil. Made specifically for the 11-inch iPad Pro and 12.9-inch iPad Pro (3rd generation). 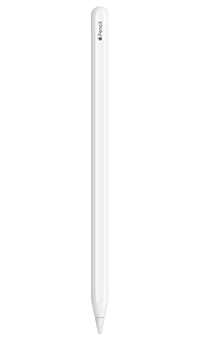 The new Apple Pencil starts charging when you place the flat part on the right side of your iPad Pro. It also pairs automatically with your device. And you can charge your iPad Pro and Apple Pencil at the same time. The new Apple Pencil lets you change modes with a double tap right where your finger rests. And you can customise your taps to easily switch between the tools you use most. The new Apple Pencil is designed to be an even more comfortable, natural tool to use. The seamless design – no connectors or moving parts – makes it easy to store.